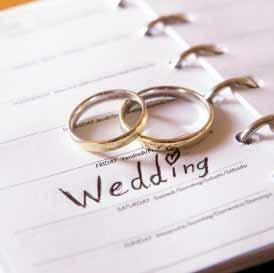 Your wedding day is one of the most important days of your life and you will want to make it a memorable one. You don’t want the memory to be how it made you broke or how you didn’t have enough money to afford all of the things you imagined having on this special day. These are the exact reasons why it is important to make a budget plan right along with your regular wedding plans. Figure out what you need to spend, how much you have to spend and what you can do without that won’t take away from this momentous occasion. Weddings are about spending, from the dress and the tux to the ring on her finger. Well, weddings are about love and commitment, but sometimes love costs money. That’s why you will want to figure out which ways you can save, like renting the tuxedo or finding a bargain on that perfect dress. From planning to inviting, you can DIY your way to a cheaper wedding. Do-it-yourself is a great way to make your wedding even more special. It may take a little extra time, but it won’t take as much money as buying all those fancy items. You can even make your own bouquet. Most women dream about a wedding vacation that sweeps them away from the real world and takes them to someplace special. Look for wedding packages that offer a great place to stay, banquet rooms for your wedding reception and something special to make it a memorable experience. The right package could offer you everything you need for your dream wedding. Packages like this, rooms for you and guests and a place to wine and dine, can offer wonderful discounts over having your wedding one place, reception in another, and staying overnight in yet another. Wedding packages and rented tuxedos aside, make sure that you budget out the money you have so everything gets covered. Figure out how much you have to spend on the dress, the flowers, the decor and the venue. Maybe your wedding will have to be at home, and you can save up money for a special honeymoon instead. Either way, you need to determine what you want to spend where, and don’t over spend. You don’t want your new life together to start out with fresh debt! A person’s wedding day is supposed to be magical and all about the bride and groom, taking a few steps to save some money can mean the difference between a stressful wedding day and a glorious one. Make it a day to remember because it was filled with love, not because you’re still paying it off by your fifth anniversary!